I make up and play lots of games to keep my life interesting. Below is an explanation of my cycling game that I play when I am bike commuting. This morning I found myself spinning into the wind. Every direction I traveled on my morning commute seemed to have a head wind or a cross wind. the wind was not too strong, just enough to be annoying. I had my CycleMee playlist on to keep my pace up and just decided to get in the drops and move along. I have a measuring point on my route that I use to gauge how fast I am going. I usually like to ride fast a few times a week. The point that I always the end to my splits at the intersection of Lily Pond Road and Newton HWY. In the morning I my goal is to get there in one hour. This means that I have to maintain an average speed of 18 MPH as this is 17.7 miles from my start. Realistically I have never made this goal and most of the time I get to this point between one hour and 5 minutes and one hour and 12 minutes. When I am really getting hit by headwinds from the east I have been as late as 90 minutes. This morning I was doing pretty good as I made it in one hour and three minutes, averaging 16.8 MPH. At this speed I am just on the boarder line of riding too fast to really enjoy being on my bike. I train like this so that I can stay strong for the long rides that I really enjoy. From my experience my ability to ride long distances has always had a foundation in regular riding when I bike commute to and from work. Some folks prefer the weekend warrior type of training, but I like to ride during the week a lot and do an occasional one hour sprint to keep my body in shape for the long 50 to 200 mile rides that I enjoy. To date I am still 279 miles below my goal of 10,000 miles year to date. 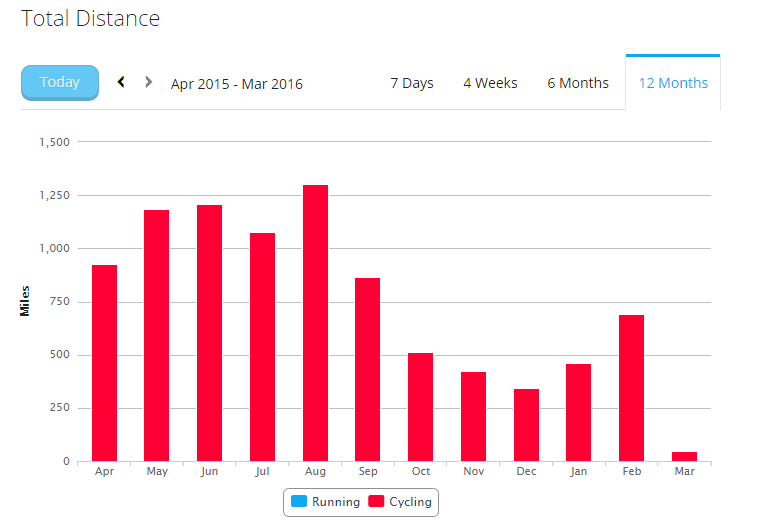 My monthly mileage really dropped off starting in the fall of 2015. It is interesting to me how the holidays and cold weather affect my ability to get on my bike during the week and ride to work. During December there was a long break of about two weeks when I did not ride due to a trip to Texas for the holidays. As spring approaches my days in the saddle will increase and I will get happy and ride in the daylight more often. I like riding in the dark a lot, but eventually I get tired of riding in the dark all of the time, so when daylight savings time starts I know that the days will be getting longer and my cycling will be more enjoyable when I can see the landscape further than my headlight allows me during the winter darkness. So by playing games with numbers and training incentives I keep myself motivated to get up and ride my bike to and from work. Even though I take the same route during the winter, there is still enough variations in the weather to keep me motivated to get out and ride my bike each day. During the cold winter I do not want to be on a route that my wife does not know if I have a tire failure. I have an understanding with her that if I have a flat and it is too cold for my fingers to work that I am going to call her and wake her up so that she can come and get me. During the warmer months I will start doing my longer routes to work and take alternate routes to work than my 25 mile route. I have been known to ride a 50 mile one way commute to or from work. In 2014 I did 100 miles commuting in one day by riding my Leary Route to and from work. I did not do this last year because part of the game is that I try to get home by 7 PM. My wife does not like to eat late and I really appreciate coming in from a sometimes cold ride to be greeted with a nice home cooked meal. I am amazed to think that every twelve hours I am on my bike at some point between work and my house. In the morning I am riding between 5 AM and 7 AM, and in the evening I am riding between 5 PM and 7 PM. When I do ride on the weekend for a charity ride I am really excited to be on my bike in the middle of the day with other cyclist. Most of my bike commuting is done solo in the dark, so riding in daylight is a big deal for me. So this is the games that I play on my bike. I write this stuff mainly for myself as it is a way to document my goals and it keeps me honest to the game. If you have made it this far then I hope that you will share some of the games that you play in your head as you ride your bike. I have found that the more cyclist share their experiences that those who do not ride their bikes or those that do not cycle at all will benefit and get inspired to ride knowing that us cyclist that ride a lot always have struggles getting on the bike each day. For me the hardest part of cycling is making my way to my bike. Once I am on my bike and making the turn from my driveway to the street I am so happy to be on my bike.